When Edgar Allan Poe first introduced the world to C. Auguste Dupin, he hit on a winning formula. Dupin was Sherlock Holmes before Sherlock Holmes. Dupin was a genius detective. He first appeared in "The Murders in the Rue Morgue." It was published in 1841. In that story, two women are dead. The game's afoot. That is what Holmes might say. Poe didn't give Dupin a fun catchphrase. The roots of the detective story go as far back as Shakespeare. This is according to historians Helena Markovic and Biliana Oklopcic. They argue that Poe's tales of rational crime-solving created a genre. His stories mix crime with a detective narrative. They revolve around solving the puzzle of the "whodunit." The stories invite readers to try to solve the puzzle too. The key figure in such a story is the detective. 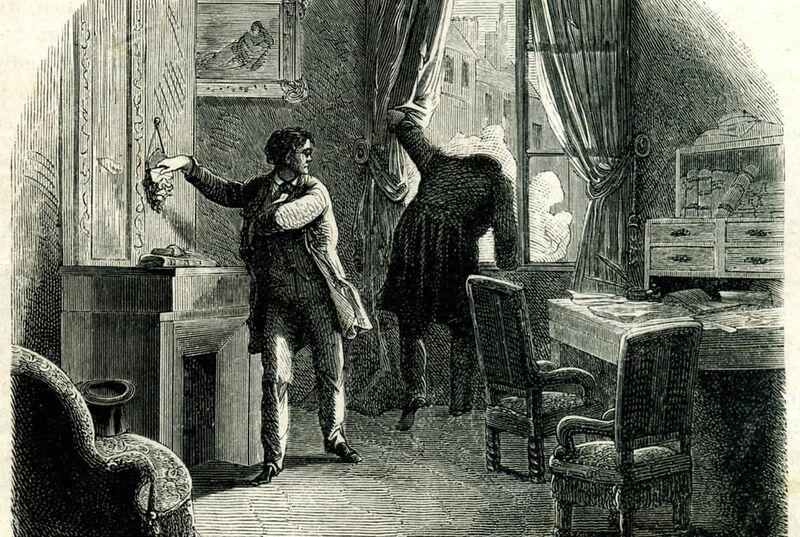 Poe's detective also appears in "The Mystery of Marie Roget" and "The Purloined Letter." He sets the stage for that character. Dupin is a gentleman of leisure. He has no need to work. He keeps himself busy by using "analysis" to help the real police solve crimes. The real police are absolutely useless. They are similar to Inspector Lestrade and Scotland Yard to Holmes. Like his literary descendant, Dupin smokes a pipe. He is generally odd. He's also unusually smart. And he is rational. He is a kind of superhero. He uses powers of thinking to accomplish great feats of crime-solving. The story's narrator is his roommate. He follows the detective around. Unlike John Watson, Dupin's roommate remains a nameless "I" throughout the three stories. But like Watson, he's an ordinary type of person. Poe introduced a number of elements in the Dupin tales. One is the friendly narrator. This would remain common to detective stories. "The elements Poe invented, such as the reclusive genius detective, his 'ordinary' helper, the impossible crime. The incompetent police force, the armchair detection. The locked room mystery, etc., have become firmly embedded in most mystery novels of today," the historians write. Even Arthur Conan Doyle had to admit Poe's influence. Doyle was the creator of Sherlock. "Where was the detective story until Poe breathed the breath of life into it?" he wrote. Poe's formula appealed in the 19th century. That's because detective stories promised that reasoning could hold the answer to every question. At the same time they had spooky overtones. They appealed to 19th-century readers' fixations with the occult. The detective story, writes Ben MacIntyre for The Times of London, was especially appealing. It promised that intellect will triumph. The crook will be confused by the rational sleuth. Science will track down the criminals. That will allow honest souls to sleep at night. At the same time, MacIntyre writes, 19th-century anxieties about the Industrial Revolution and new ways of living supported the idea that evil was anonymous. And, it was everywhere. These two instincts - "faith in reason and mistrust of appearance" - are what made Victorians love detective stories. Why is Dupin referred to as "Sherlock Holmes before Sherlock Holmes?" cause john watson was so powerful. they referred to him to be sarcastic because he was really smart. nah dur sherlock! because he was very smart and he was and very good at his job. Because he hit on a winning formula. Because he was very smart and people use the quote"no way Sherlock".